Django Unchained To The South: Go Screw Yourself! There’s been volumes of analysis of the film from black intellectuals…to switch it up, here’s a take on the film’s political messages from a white guy. 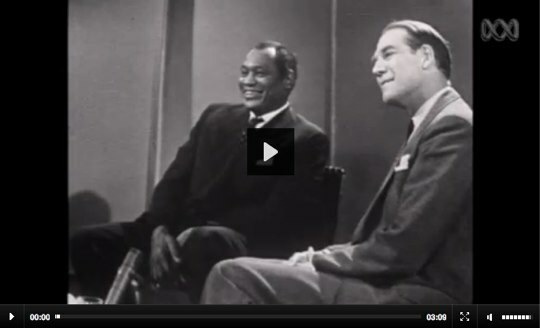 Actor, Scholar, Athlete and Activist Paul Robeson interviewed in Austraila. I was travelling last week, so I missed posting these before his 85th birthday. By popular demand, I’m posting these now. I often say I hate poetry, but that’s not really true. I just think it’s the hardest of all art forms, and unless you succeed wildly, you fail miserably. Which is why I am grateful to Harry Allen for sharing this with me. Thank goodness for guys like Keith Olberman who are willing to speak truth to power.